SYDNEY -- The siege of a downtown Sydney cafe where a a suspected Iranian-born Islamic extremist had been holding 17 hostages for 16 hours ended early Tuesday morning with three people dead, including the gunman, after police raided the building. The suspect, who first took the cafe during Monday morning rush hour, was identified by police as local Muslim cleric Man Haron Monis, who had taken to calling himself "Sheikh Haron." Officials said he died after being shot during the raid. There were two other fatalities confirmed by officials. One of the victims was Sydney lawyer and mother-of-three Katrina Dawson, 38. Tori Johnson, 34, was also killed. Additionally, numerous hostages were injured during the incident, and a police officer was shot in the face. Officials said the officer is in stable condition, however. A local hospital says at least one hostage was receiving treatment for a gunshot wound to the leg. The wounded hostage, a woman in her 40s, was in serious but stable condition at Royal North Shore Hospital, spokeswoman Jenny Dennis said. She was admitted shortly after police stormed the cafe. Scipione wouldn't say whether the two hostages who were killed - a 34-year-old man and a 38-year-old woman - were caught in crossfire, or shot by their captor. Monis, 50, was an Iranian refugee in his late 40s who had long espoused extremist views in Australia. There is no known connection between Monis and any potential plot in the U.S., a law enforcement source told CBS News. Last year, he was sentenced to 300 hours of community service for writing offensive letters to families of soldiers killed in Afghanistan. At the time, Monis said his letters were "flowers of advice," adding: "Always, I stand behind my beliefs." A U.S. intelligence source confirmed to CBS News that the man was known to authorities in the country and has been arrested previously for extremist activity. So far there have been no indications that Monis had any direct connection with international terrorist organizations. "This is a one-off random individual. It's not a concerted terrorism event or act. It's a damaged goods individual who's done something outrageous," his former lawyer, Manny Conditsis, told Australian Broadcasting Corp.	"His ideology is just so strong and so powerful that it clouds his vision for common sense and objectiveness." Monis was originally a Shiite, the national religion of his native Iran, but appeared to be somehow in support of the Islamic State of Iraq and Syria (ISIS), a Sunni extremist group that has frequently targeted Shiites in its campaign. The siege Monis initiated began around 9:45 a.m. in Martin Place, a plaza in Sydney's financial and shopping district that is packed with holiday shoppers this time of year. Many of those inside the cafe would have been taken captive as they stopped in for their morning coffees. Throughout the day, several people were seen with their arms in the air and hands pressed against the window of the cafe, and two people holding up a black flag with the Shahada, or Islamic declaration of faith, written on it. Seven Network television news staff watched the gunman and hostages for hours from a fourth floor window of their Sydney offices, opposite the cafe. The gunman could be seen pacing back and forth past the cafe's windows. Reporter Chris Reason said the man carried what appeared to be a pump-action shotgun, was unshaven and wore a white shirt and a black cap. Earlier Monday, network staff counted about 15 different faces among hostages forced up against the windows. "The gunman seems to be sort of rotating these people through these positions on the windows with their hands and faces up against the glass," Reason said in a report from the vantage point. "One woman we've counted was there for at least two hours - an extraordinary, agonizing time for her surely having to stand on her feet for that long." At some point, five people escaped their captivity, running into the arms of waiting and heavily armed police outside. In the early morning hours, several loud bangs were heard around the cafe, and several more hostages were seen escaping. Commandos stormed the building, and a short time later officials pronounced the situation resolved. 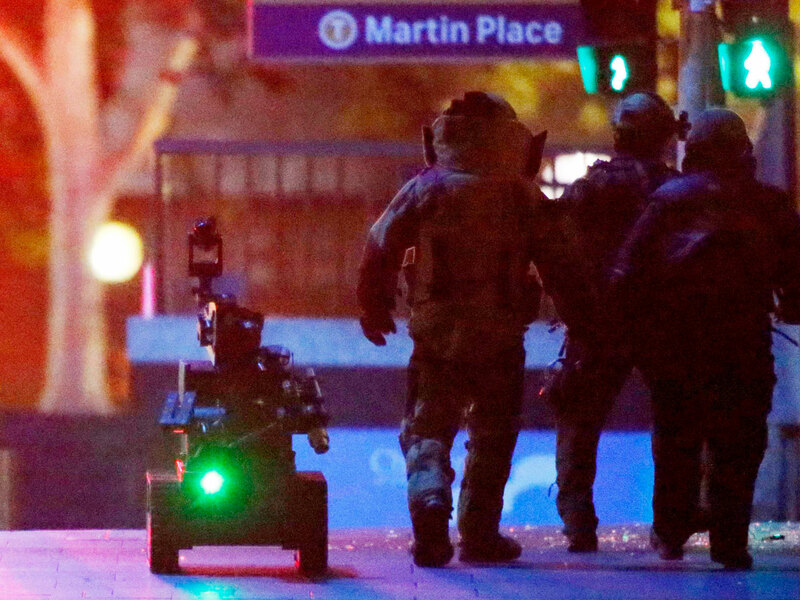 A police bomb disposal robot also was sent into the building, but no explosives were found. St. Vincent's hospital spokesman David Faktor said a male hostage was in satisfactory condition in the hospital's emergency department. He was the only one of the freed hostages to be taken to a hospital, and Scipione said he was being treated for a pre-existing condition. The U.S. Consulate is also located in the vicinity. The State Department said Sunday all of its personnel had been accounted for and none were among the hostages. CBS News partner Ten Eyewitness News reported it spoke directly to two hostages inside the cafe, who confirmed the gunman had made two demands: He wanted an ISIS flag delivered to the cafe, and wanted to speak to the Prime Minster Tony Abbott. Australians took to Twitter shortly after the incident began to show solidarity with the country's Muslims, fearful of any anti-Muslim backlash. They used the hashtag #illridewithyou, offering to ride on public transportation with Muslims wearing traditional clothing. Videos of at least three people who appeared to be inside the cafe surfaced on YouTube. In the videos, women identified themselves as hostages and relayed the demands of the hostage taker, who the women said wanted it to be known that this was an "attack on Australia by the Islamic State." "This is almost the prototypical type attack that we believe lone-wolves to be capable of," CBS News security correspondent Bob Orr said on "CBS This Morning." He said it appeared to be the "most dangerous type of threat to try and prevent." Australia has been a frequent partner of the U.S. in its recent military campaigns in the Mideast. It has also vocally backed the U.S.-led coalition combating ISIS in Iraq and Syria. Australia's government raised the country's terror warning level in September in response to the domestic threat posed by supporters of ISIS. Counterterror law enforcement teams later conducted dozens of raids and made several arrests in Australia's three largest cities - Melbourne, Sydney and Brisbane. One man arrested during a series of raids in Sydney was charged with conspiring with an ISIS leader in Syria to behead a random person in downtown Sydney. ISIS, which now holds a third of Syria and Iraq, has threatened Australia in the past. In September, ISIS spokesman Abu Mohammed al-Adnani issued an audio message urging so-called "lone wolf" attacks abroad, specifically mentioning Australia. Al-Adnani told Muslims to kill all "disbelievers," whether they be civilians or soldiers.